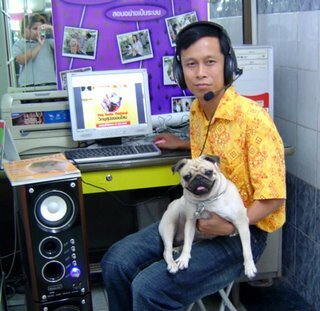 A director of dog grooming school in Thaildand launched an internet radio station whose intended audience is dogs. He said that he'd noticed that music improved the mood of dogs he grooms. The radio will air Thai pop music and programs in which the DJ will "talk to the dogs in Thai" and encourage the listeners to respond. "We may have a dog greeting show, in which we'll repeat 'sawasdee' ('hello') over and over. The dog may lift both paws in response. In some houses, the dog may lift only one paw. It depends on how the dog was trained. If we play a slow song, we may have the DJ howl... because dogs howl, too, when they hear sad sounds." (Here's a recent CNN story). of radio ads for dogs? Say, a sound that reinforces the dog's reflex toward a particular brand of dog food?